I just received the newest release (February 18, 2014), Panther Burn, from Jim Suhler and it's a keeper. 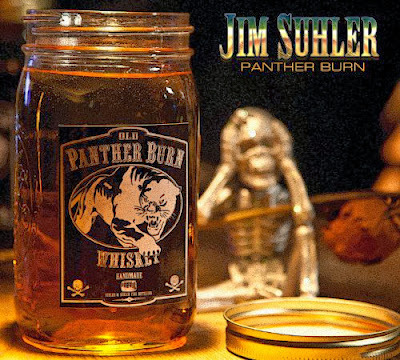 Opening with title track, Panther Burn, Suhler blends that rare swamp sound with rock and blues to create his own unique sound. With Tim Alexander on organ and Beau Chadwell on drums, Shuler creates a really cool story line and super guitar riffs. I Declare is more of an uptempo shuffle with Kim Wilson backing Suhlers vocals on harp. Alexander plays nice piano riffs over a basic shuffle rhythm, Wilson get a nice opportunity to stretch out and does so nicely. Across The Brazos is one of my favorite tracks on the release with a modified blues vamp. Understated guitar riffs going on throughout the track as well as nicely developed piano riffs make this one a definite listen. Leave My Blues Behind is a quick paced jazz/blues style track. A lot of swing is included in the DNA of this track and Suhler really rips some tasty guitar work on this track. Shawn Phares joins on organ for this track and is definitely noticible. He is also backed by Ron Jones on sax and Galen Jeter on trumpet. Sounding like a nod to a classic rocker from Steppenwolf with a San Francisco twist, I See You keeps it simple and loose. Remember Mama is a very cool instrumental giving Suhler the opportunity to play some clean euphoric slide work. Texassippi has a country back bone and an easy going pace. Soothing vocals and melodic guitar work are the key to this track. Sky's Full Of Crows continues along the country styling with train pacing compliments of Jimmy Morgan on drums and James Mohmed on percussion. A vocal story telling pace similar to older Bob Dylan give the track a certainty and immediate likability that you rarely hear. Another really cool track. Between Midnight and Day has a cool mixture of musical architextures (I hear King Crimson, Jimi Hendrix and Molly Hatchet to mane a few). Jason Elmore joins on this track and adds to the guitar pyrotechnics. Dinosaur Wine steps back toward the two step feeling of country/rock music of course without the hollywood flash and over the top steel guitar but with the honesty of it's simplicity. I've been listening to Suhler for quite some time since being introduced to him by acquaintance David Wilson who writes the Tonequest Report. I initially listened to hear his guitar but have found that he really has a fine voice. Amen Corner has a real simplicity to it making it another of my favorites on the release. With a mixture of gospel, country and blues featuring Suhler and Alexander it is a real cool little track reminiscent of some of the Delaney and Bonnie with D Allman. Jump Up, Sister is another "happy" track in the D&B genre with Suhler adding some tasty slide work and steady driving drum work from Chadwell. Worldwide Hoodoo is a driving rocker with flaming guitar riffs. This is a cool track to wrap the release with well blended bass leads, organ leads and guitar riffs.